Next to the Billy Wright pub in Wolverhampton is a cafe with a sign in the window that sums up the mood of the place right now. ‘Nuno eats here for free,’ the joyous message reads. It is more than an empty offer. Slightly further along the street is Aromas De Portugal, the coffee shop that sells pastries from the Wolves manager’s homeland and he has been known to pop in. 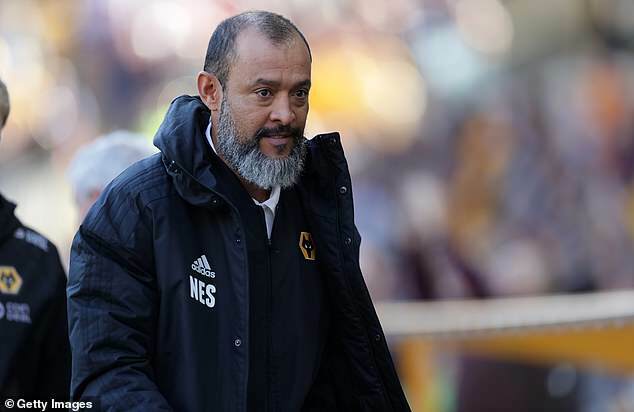 Should Nuno Espirito Santo maintain current momentum he won’t need to shop for food again. 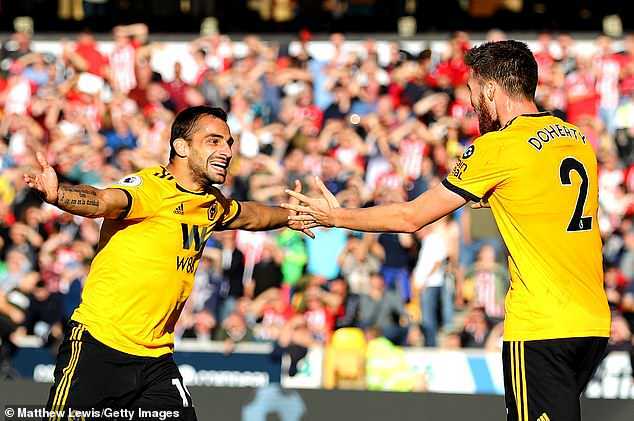 The colour of the famous strip this season may be closer to mellow yellow than old gold but fans with long enough memories believe Wolves are playing a style of football comparable to the finest periods in the club’s storied history. Supporter John Lally was a boy when Wolves won three First Division titles in the 1950s, before attending his first match in 1960 and sitting in the Stan Cullis Stand ever since. 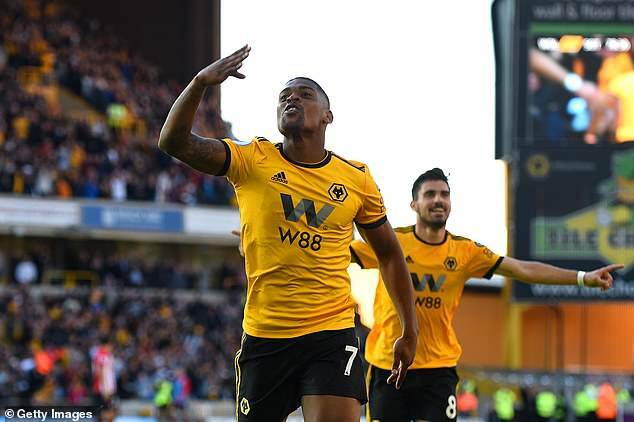 Victory over Southampton took Wolves to within three points of the Champions League places and, while only the most romantic think that final position is possible, the sense is growing that a top-half finish is entirely realistic. 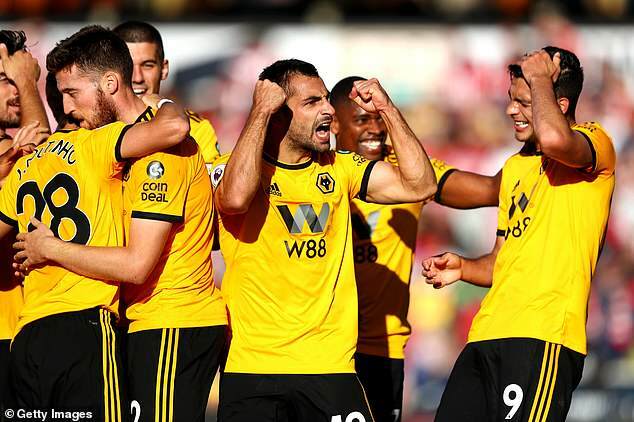 It required persistence and two late goals to earn a third win of the campaign as Ivan Cavaleiro scored with his first touch in the Premier League and Jonny Otto added his first for Wolves. Converting chances has been an issue for the side and might need resolving with a January signing but once again Nuno oversaw a performance that offered a clear identity and unflinching imagination. 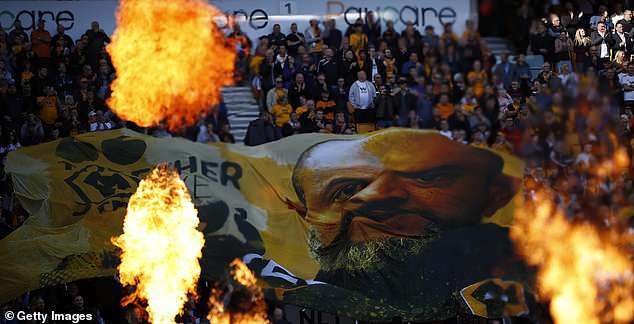 ‘Nuno’s the Special One,’ sang those in the South Bank towards full-time. While Jose Mourinho appears to be scratching around for any semblance of a plan, Nuno’s ideas are fully formed. His players know their roles and move across the pitch in synchronicity to prise open gaps in attack and maintain solidity in defence. Former striker Steve Bull was there and wore a look of elation as the goals went in. Ruben Neves was actually quiet against Mark Hughes’s side and Diogo Jota is yet to properly spark in the Premier League, so this was a match to recognise others. Matt Doherty was exceptional down the right — setting up the second — and Conor Coady gave another accomplished display in central defence. England are monitoring the Wolves captain’s progress and Lally is full of admiration, comparing Coady to Frank Munro, who made more than 300 appearances for the club. ‘Believe you me, for any Wolves fan of my era to compare a player with Frank Monroe is praise indeed,’ Lally says. ‘Frank was a tank of man but had the subtlety of a violin player. Coady was a modest midfield player before Nuno arrived but now I wouldn’t swap him for John Stones. Chairman Jeff Shi has moved with his family from China to Wolverhampton and is a regular presence at the training ground, an indication of how closely club owners Fosun International are studying matters. The Chinese conglomerate, led by Guo Guangchang, will supply the funds for Nuno to have the squad he desires. In the summer, that included a club record £18 million for Adama Traore, the winger whose speed created Cavalerio’s opening goal. It is a world away from that 2013-14 season spent in League One, when manager Kenny Jackett had to trim finances. ‘It doesn’t seem five minutes since I was going to Crawley and Stevenage,’ said Lally. ‘The transformation is astonishing. Coady said the team are determined to maintain their form. ‘We sustained it last season in a tough division and we’ve got to try to do it again,’ he said.